You can’t overvalue a great pair of hiking socks: they keep your feet comfortable and dry while helping to prevent blisters and hotspots. 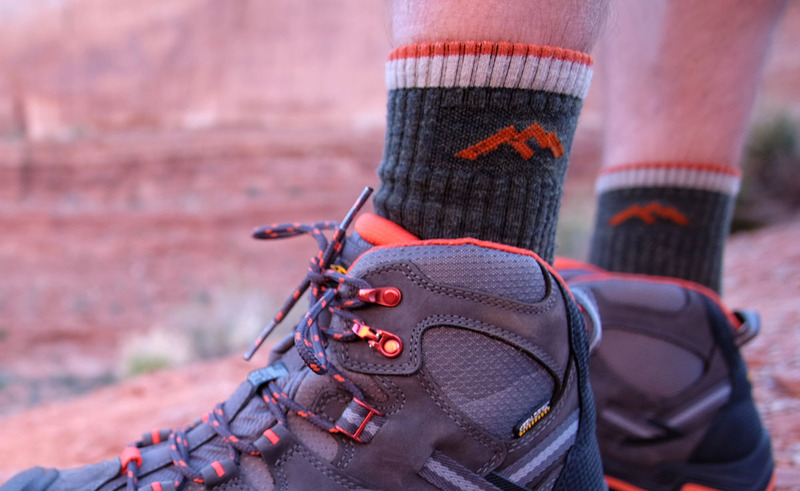 We tested the full array of quarter height and crew styles in varied conditions from the heat of Utah’s Canyonlands to the snow of Washington’s North Cascades, and below are our picks for the best hiking socks of 2019. Most of our favorites are made with merino wool, which has become the standard-bearer in socks and performance outdoor apparel in general. It’s true that quality hiking socks are pricey—they generally run in the ballpark of $20 per pair—but all of the options below are tough enough for trail duty and made to last. 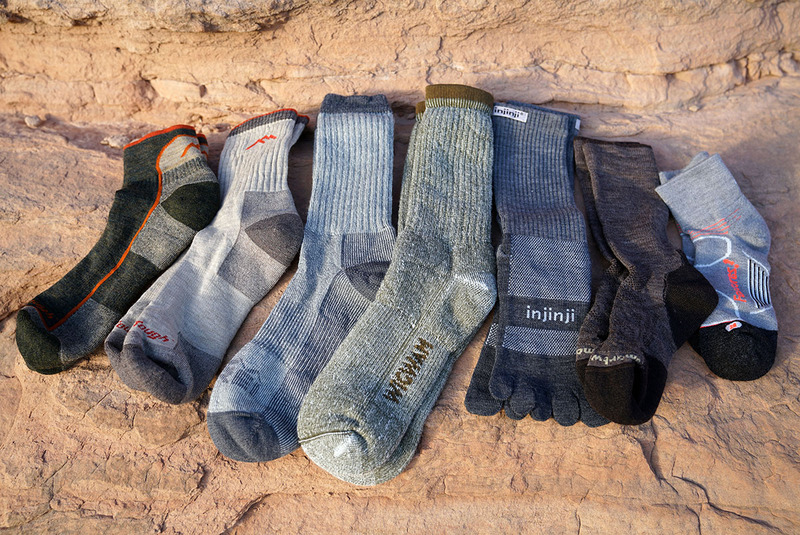 For more information, see our hiking sock comparison table and buying advice. And for more on hiking footwear, we’ve tested and written about hiking boots and lightweight hiking shoes. What we like: Comfortable and last forever. What we don’t: Tough construction means they aren’t quite as plush as some other socks on this list. Smartwool used to be synonymous with hiking socks, but over the past few years Darn Tough has taken the lead. With cozy seamless construction, high quality merino wool, and a lifetime warranty to back it up, Darn Tough socks simply are the best. Our favorite model for hiking and backpacking is the Micro Crew Cushion. High-density knitting creates excellent padding and breathability for virtually any three-season outdoor activity. The fit is super comfortable, not overly elasticized around the arch or forefoot, and doesn’t bunch or create pressure points. As we've found, no sock is totally perfect. Our nitpicks with the Micro Crew are that the cushioning underfoot can make the sock a little warmer on hot days than true lightweight models like the Smartwool PhD's below, and the tough construction means losing a tiny bit of plushness. But this is telling: in all the miles we've racked up with our Micro Crews (some are 7+ years old and counting), we haven’t put a hole in one sock. What we like: Performance fit and improved durability. What we don’t: Can't match Darn Tough's lifetime guarantee. We used to favor Smartwool’s traditional Hike Light Crew below, but the PhD line—named for Smartwool’s performance socks and clothing—offers the same comfortable feel with a more dialed-in fit. The snug PhD’s hold your arch and instep really well, and an “x” design of stretchy nylon across the top of the foot keeps everything in place while hiking. There are three thickness available (ultralight, light, and medium cushioning), but our favorite is the lightweight model, which has sufficient padding under the heel and forefoot for trail running, hiking, and lightweight backpacking, but is thin everywhere else. The mix of different fabric thicknesses makes them excellent breathers, even underfoot—a place of weakness for classic hiking socks. We’ve had durability issues with the previous PhD line—particularly at the heel—but Smartwool now uses Indestructawool technology, which is a denser and tougher wool blend. The PhD has Indestructawool in the heel and toe, and we must say it has proven to be durable over the past few years without a noticeable change in comfort. Smartwool still can’t match Darn Tough's lifetime guarantee (although 2 years is pretty good), but we think they've taken an important step in returning to their long-lasting roots. What we like: A good value, soft feel. What we don’t: Spandex loosens over time, not as durable. 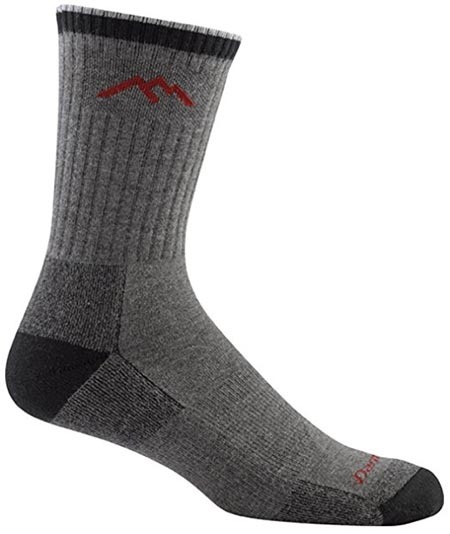 If you’re sold on the benefits of merino but are looking to save, the REI Lightweight Merino Wool hiking socks are just the ticket. For a reasonable $17, you get the comfort and temperature regulation one expects from merino (and a lot of it at 79%) with few compromises. With good cushioning, especially at the heel, the socks perform similarly to the more expensive Smartwool Light Hikers below. The primary sacrifice with the REI Lightweight Merino is that the spandex around the arch can get a bit loose after extended wear and doesn’t last as long as more expensive models on this list. And over time, we have seen some pilling if you put them in a dryer (they line dry just fine). Further, the two-section color scheme that’s darker along the back of the leg is a bit polarizing. But at a significant savings, many people think they are worth it, and particularly for crossover hiking, mountain biking, and everyday use. What we like: Great for summer hiking. What we don’t: Thin for extended trips. For warm weather hiking, trail running, and casual use under your sneakers, this is our favorite ultralight hiking sock. Well priced at $16, you get a great fit, superb breathability, and a very comfortable feel. 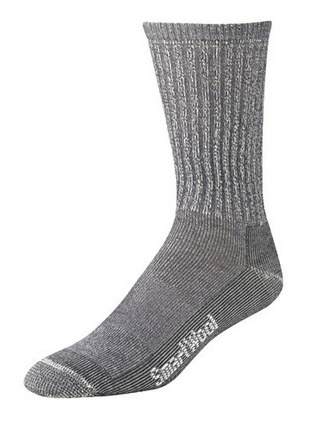 And as with the PhD Outdoor Light Crew above, Smartwool added Indestructawool to these socks for a boost in durability. They still won’t last forever, but the Ultra Light Mini is a nice option for summer when you don’t need serious cushioning. What are the downsides of choosing an ultralight hiking sock like the Smartwool? The materials are considerably thinner than the lightweight options above, even in critical areas like the heel and toebox. But if you have tough feet and can avoid blisters, these socks will help keep your feet cool even during the hot summer months. If you need some extra cushion, Smartwool does made a padded quarter height model, but in that category we prefer the Darn Tough cushioned version below. What we like: Cool and light. What we don’t: The lower cut means less protection. For those who like to move fast and light, we love the Darn Tough Quarter Cushion. 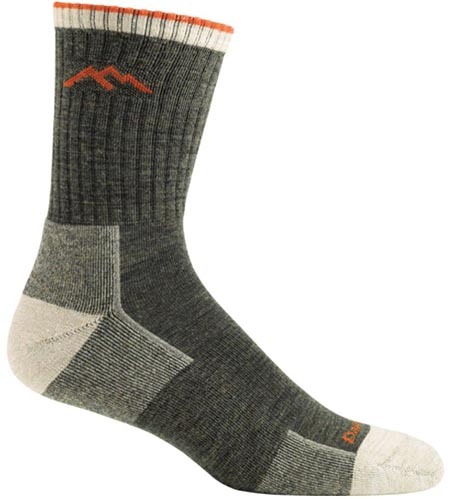 With these hiking socks you get all of the comfort, moisture wicking ability, and odor protection of crew-height socks, but without as much material holding you back. It's true, they aren't tall enough for all hiking boots, but they're a great pairing with ankle-height hiking shoes or trail runners. 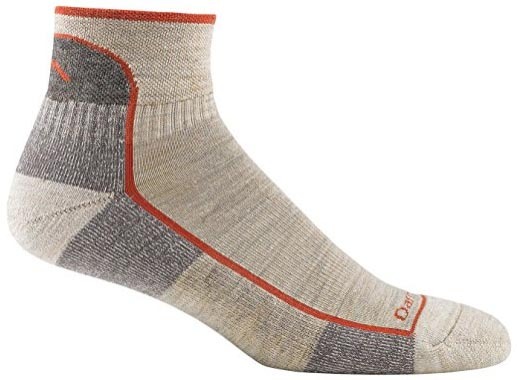 Keep in mind that the Darn Tough Quarter Cushion aren’t true ultralight socks like the Smartwool Phd Ultra Light Mini below, meaning that your feet can get warm in the heat of summer and won’t dry out as quickly. But we love the less bulky feel and heartily recommend these socks to anyone who doesn’t care for the higher cut but still wants the cushion. 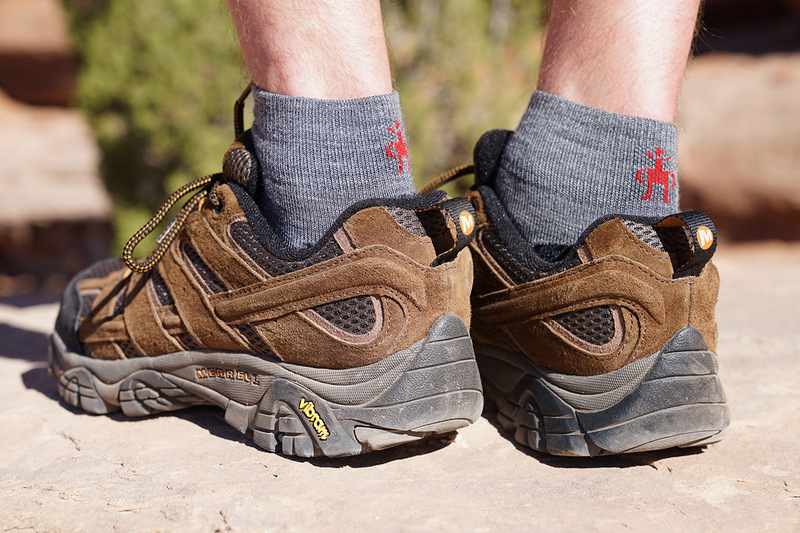 There's a reason these socks are popular with high mileage thru-hikers and serious backpackers: they get the job done. What we like: Well-fitting and anatomical toe box. What we don’t: Cuff has a tendency to slide down and bunch up. Icebreaker is a merino specialist based in New Zealand, sourcing wool straight from sheep in their home Southern Alps. We’d be remiss not to include their Hike+ sock in our mostly-merino lineup—wool just doesn’t get much better than Icebreaker. Sized anatomically, these socks have a “left” and “right” label and the best-fitting toe box of any we tested, which is particularly nice if you have narrow feet or your socks tend to bunch up around the toes. The fit reminds us of the PhD socks from Smartwool above but a bit less extreme. Keep in mind that Icebreaker’s "Lite" is on the thinner end of the cushioning spectrum, and it’s closer to an ultralight sock than other lightweight models. They ventilate well and are great for warmer weather, but for backpacking with a load, we’d opt for the medium weight. And the crew style fits a little longer (in other words, taller) than the Smartwool PhD and Darn Tough Micro Crew, and the cuff can eventually stretch with use, giving these socks a tendency to droop slightly (particularly for those with skinny calves). Overall, we like the Hike+ Light, but it’s tough to compete with the Darn Tough warranty (and the Icebreakers cost the same). What we like: Durable and cozy. What we don’t: The fit isn’t quite as tailored as Darn Tough’s Mountaineering socks. Chances are that if you like Smartwool’s lightweight hiking designs, the Trekking Heavy Crew will make you happy as well. These burly socks are made from 70% merino wool and have the same traditional look and feel as the Hike Light Crew below. You do get a noticeable boost in warmth and thickness around the foot, which works well for winter outdoor activities and summer backpacking for those who want maximum cushion (at the sacrifice of breathability). As with the Darn Tough Mountaineering socks below, make sure to take your boot size into account: these socks won’t necessarily bump you up a size but they do add noticeably more bulk than lightweight hiking socks. For a slightly cheaper option that is similar to the Smartwool, check out the popular $20 REI Co-op Merino Wool Heavyweight. Comparing the two, the Smartwool is thicker, more durable, and has a better overall fit (the REI is a little too loose for our tastes). As such, we think the Smartwool is worth the extra money in most cases. But for easy-going activities, the REI is a fine choice. What we like: Snug fit and good breathability. Darn Tough and Smartwool both offer ultralight hiking sock models, but we stumbled upon running-centric brand Feetures and came away impressed. With this sock you get perhaps the most comfortable fit of the ultralight pack—the snug feel borders on compression but isn’t quite there. 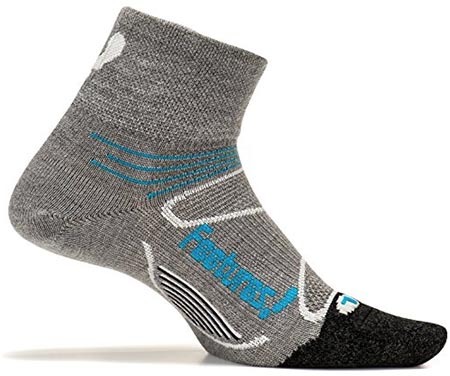 Along with good cushion and thin panels on the top of the foot for breathability, the Feetures Elite Ultra Light Quarter is a competitive hiking sock option for warm weather. It’s worth noting that we’ve chosen the quarter height version here, which offers enough clearance for most low and mid-height shoes and boots (those wearing high-cut boots should choose a crew sock). There are some downsides to choosing an ultralight sock like the Feetures. First, the thinness helps with breathability but does compromise long-term durability. We recommend washing Feetures in cold water and line drying (machine drying is a quick way to ruin them). Second, these socks add little to the size of your foot and therefore can you make your hiking shoes or boots feel roomy. But if sizing is not an issue, we like the Feetures Ultra Light for summer hiking and trail running. 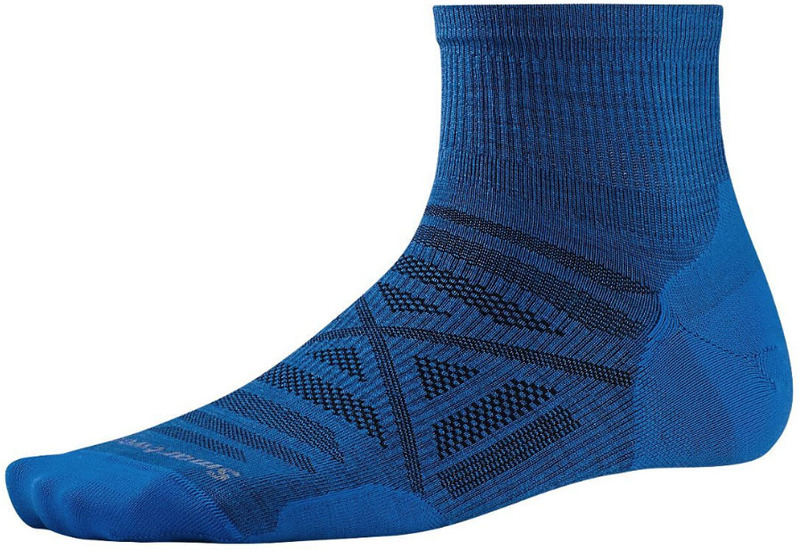 What we like: A high-performance synthetic sock. What we don’t: We still prefer merino over Coolmax. On particularly hot summer days, you just might not want to put wool on your feet, which is understandable. 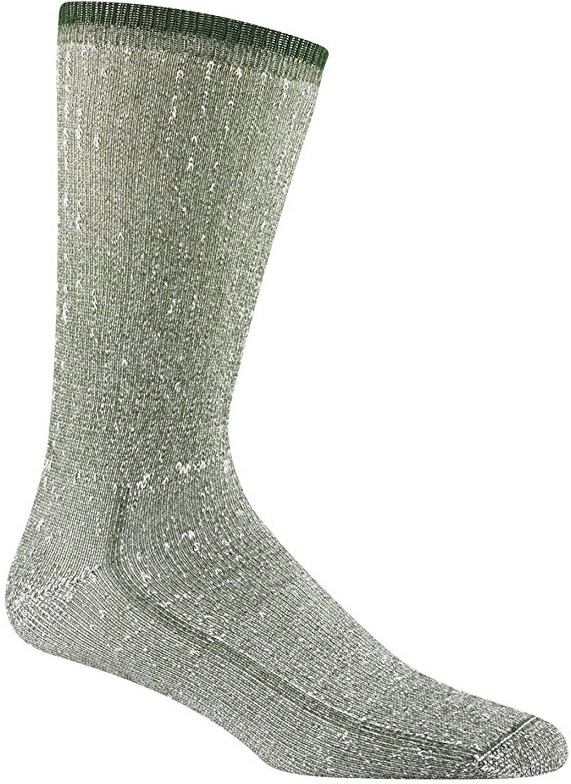 For these occasions, Darn Tough makes a synthetic sock with Coolmax polyester, a highly porous fabric that is made specifically to keep your feet cool. 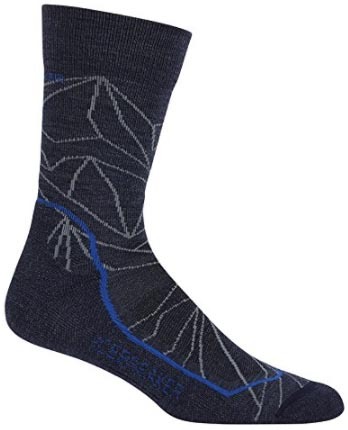 These socks are a dream come true for hot-weather hikers, and like our favorite merino models, they are snug fitting, well-cushioned, and do not stretch with use. All that, and the bump in breathability is noticeable. Compared to REI’s Coolmax sock below, Darn Tough’s version is better made and offers a much closer fit. In fact, it’s one of the only non-merino socks that you’ll find us recommending for serious performance use. Unfortunately, Coolmax socks undeniably hold stink far more than merino models, which is a big downside. Unless you’re specifically looking for an alternative from wool or hiking in the warmest of temperatures, we still deem merino to be superior in almost every way. What we like: Comfortable on and off the trail. What we don’t: Don’t last quite as long as they once did. The Smartwool Hike Light Crew led the market for years, especially before Darn Tough expanded its reach. These socks are more traditional in terms of fit than the options above but are hard to knock: they perform well, are comfortable, and keep their shape after numerous wears and washings. If you don’t need a performance feel—and particularly if you want something to pull double duty around the house or cabin—these are a great option. The Hike Light name is an accurate designation—the thinner construction and knitting style make them relatively good breathers. The fit is a bit looser than more modern designs like the PhDs and Darn Toughs that top our list, and the padding covers the entire bottom of the foot as opposed to more streamlined designs that better balance thickness and bulk. But most importantly, they’re no longer the durability champ: we’ve put holes in the heels of ours, albeit after a few years of use. What we like: Great protection from blisters. What we don’t: Not very cushioned. For those with tender feet that are prone to blistering, Wrightsock has come up with an interesting solution. Made with a unique double-layer construction, the sock design works to absorb friction from your shoe or boot, leaving your foot relatively unscathed. Additionally, the moisture-wicking inner layer keeps your feet dry, providing yet another barrier against blisters. In fact, Wrightsock believes in their design so much that they offer a “blister-free guarantee” (a refund won’t matter much if you’ve been suffering on the trail, but we do appreciate the confidence). The Escape Crew is an alternative to most of the merino styles here, made with a polyester/nylon/lyrca blend. If you’re looking for a warm or highly durable sock, this isn’t it. 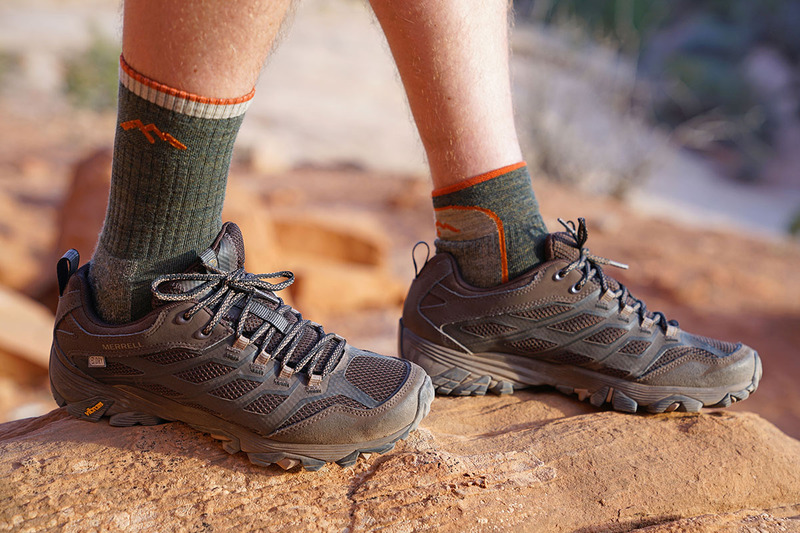 But if you want a light hiker for the summer months that will keep your feet cool and ward off hot spots and blisters, we recommend checking out Wrightsock. And at $18, they’re a pretty decent value too. What we like: Five-toe design can help with hotspots. What we don’t: Takes longer to put on than other socks and can spread out the toes. We’ll start this write-up by saying that new gear technology isn’t always better, and we hesitate to jump on the bandwagon until the results come in. 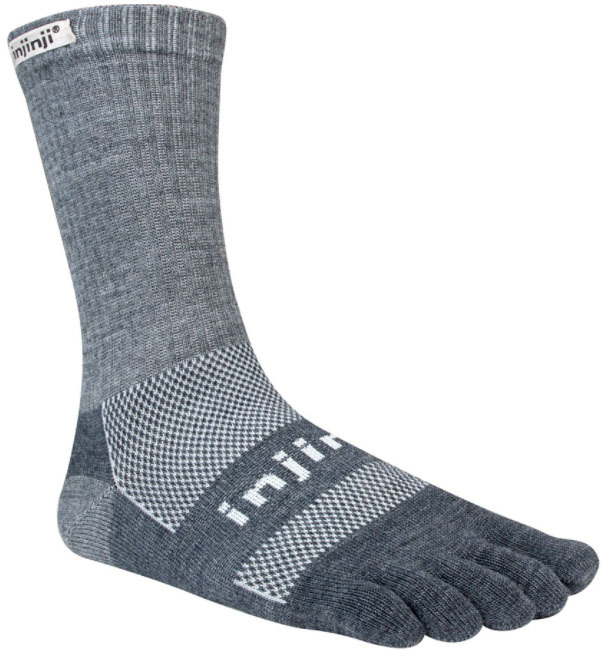 These unique Injinji toe socks beckon a certain toe shoe controversy from a few of years back, but after strong reviews we had to give them a shot. Essentially, instead of a traditional sock, Injinji uses a five-toe design that claims to reduce the possibility of blisters and hotspots. This “Midweight” model offers additional cushioning over the thin “Original Weight” sock. 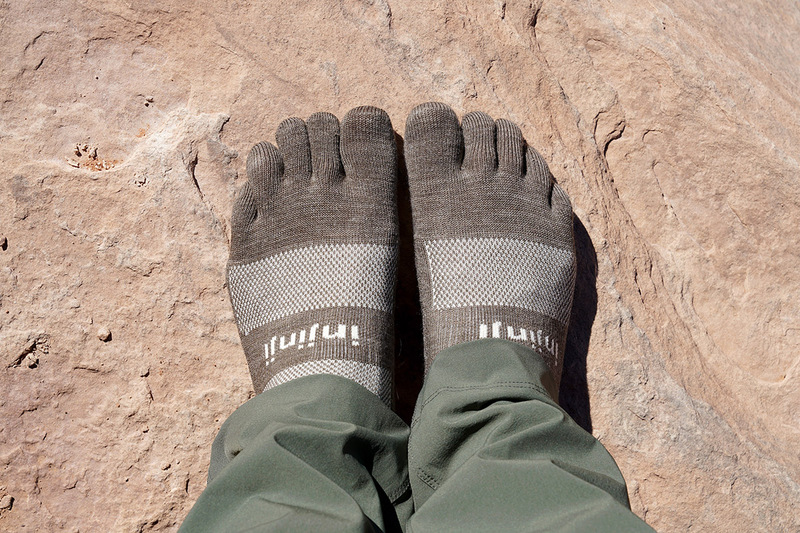 What’s the verdict after hiking and backpacking in Utah’s Canyon Country with the Injinji Outdoor Midweight? One editor liked the toe sock design and found it quite comfortable. The other felt that it separated his toes more than usual thereby causing some discomfort. Both found that the socks took longer than normal to put on and offered little discernible upside compared to our top picks. If blisters and hotspots are a major issue for you, it may be worth giving the Injinji a shot. If not, traditional hiking socks perform great and require less effort. What we like: A good value for merino wool socks. What we don’t: Fit is less tailored than the models above. 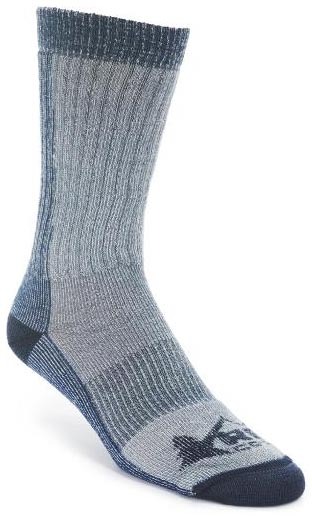 You don’t have to pay an arm and a leg for merino wool hiking socks, which is evidenced by Wisconsin-based Wigwam. These socks undercut the competition above by quite a bit—you can pick up a 3-pack for just over $12 a pair, the total cost of which won’t even get you two premium socks from Darn Tough or Smartwool. The ratio of merino (67%) is right on par with the competition, and Wigwam’s are manufactured in the U.S.A., a nice bonus. All in all, we like the Wigwams best for casual use and light hiking. They are relatively thick all around the foot and have a less tailored fit than some of the performance-oriented models above. But for cold weather, hanging out at the cabin, and shorter hikes where bunching won’t be an issue, Wigwam is a great way to save on merino hiking socks without compromising much on quality. What we like: Environmentally-friendly polyester socks. What we don’t: Not the highest quality sock on our list. Merino wool socks can be a bit itchy for some with highly sensitive skin, and if that’s you, REI’s Coolmax are a good option. Made with fabric constructed from recycled plastic bottles, these socks provide a soft next-to-skin experience without the usual environmental burden of polyester. They wick moisture very well too, making them a great choice for hot weather adventures when you still want the cushioning and support of a midweight sock. At $15, the REI Coolmax socks won’t break the bank, but are only a couple dollars savings from REI’s merino model and will hold stink a great deal more. And compared to Darn Tough’s Coolmax sock above, they generally fit less snugly (especially over time). As with the Wigwam above, they excel for casual hiking and everyday use—especially in warm weather. But if you're anticipating a long-term investment for serious hiking, we recommend going with a merino sock or the Darn Tough Coolmax model. What we like: Top-notch cushioning and warmth. What we don’t: Overkill for many conditions. You don’t actually have to be a mountaineer to appreciate this sock. The Darn Tough Mountaineering can be worn as a cold weather hiking sock, for snowshoeing, and it makes a pretty nice partner for lounging around a chilly mountain hut. Some people even use this sock for regular non-winter backpacking as the thick cushioning is superb (for sizing your boots, make sure to account for the extra thickness). Keep in mind that the Darn Tough Mountaineering Sock runs up to just below the knees—the elastic does keep things nice and tight so slippage is rare. Most people will find them way too hot for summer, but they can be nice for blister prevention on long hauls. In the end, they have fairly limited year-round appeal but are an interesting option for those who desire the extra thickness or warmth. Years ago, you might have seen a smattering of cotton and polyester hiking socks on the trails, but merino wool is now the leader far and away. Merino is extremely comfortable, wicks moisture well, and does a nice job of breathing and regulating temperature. It also takes much longer to build up stink, allowing for extra days of wear on a hiking or backpacking trip (how many days is up to you). Cotton, on the other hand, is heavier, absorbs moisture, and doesn't dry when wet. And while polyester may keep you cool, we are yet to find an option that doesn't start stinking rather quickly. What exactly is merino wool and what makes it so great? Merino is a highly prized type of sheep that lives predominantly in harsh mountain environments, including New Zealand’s Southern Alps. Having to adapt to their tough environment is what gives merino wool its excellent performance characteristics, and the merino variety isn't itchy like wool socks of old. There are a number of merino breeds and the wool strands vary in thickness from ultrafine (17.5 microns and below) to strong (24 microns). For more information on the material, check out our article: Merino Wool: Is It Worth It? Even merino wool hiking socks aren’t 100% merino: you’ll notice in our picks above that the percentage of merino is between 50 and 80%, with the rest being a blend of nylon and spandex. The density varies by sock as well—just because the REI Lightweight Merino Hiking Socks are 79% merino doesn’t mean they are the highest quality option. Darn Tough's Micro Crew Cushion socks, for example, are around 61% merino but the weave is denser and they tend to hold their shape better and last longer. In general, we strongly prefer merino wool over polyester. Merino is known for its natural antimicrobial properties, whereas polyester socks hold stink in a serious way (this alone has us firmly in the merino camp). Moreover, merino wool is a naturally sourced material, whereas polyester is made from plastic fibers. That said, polyester does have a couple of redeeming qualities. For one, it is highly durable, lasting longer than pure merino. In addition, it does not soak up water to the extent that merino does, allowing it to dry faster. And some of the Coolmax models provide excellent breathability for adventuring in hot conditions. Finally, for those looking for synthetic material that is kind to the environment, check out Coolmax EcoMade, a polyester made from recycled plastic bottles. Sock manufactures offer a variety of sock thicknesses designed for everything from summer hiking to mountaineering. For the purposes of this section, we are evaluating overall sock thickness (ultralight, lightweight, midweight, etc.) and not the strands themselves as described above. For three-season hiking, backpacking, and casual wear, we recommend the lightweight versions, which provide solid levels of padding and insulation for temperatures from approximately 40 degrees to 80 degrees Fahrenheit. They also wear well around the house and under your favorite pair of shoes, provided there’s enough room. 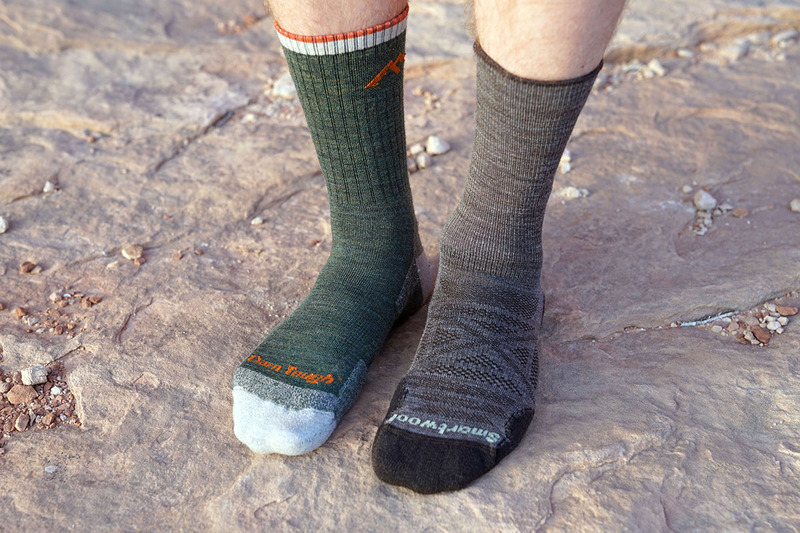 If you’re hiking in hot places like Utah or Arizona in lightweight hiking shoes, you may want to consider an ultralight hiking sock. The downside is that ultralight socks are thin on the foot and offer significantly less padding and blister protection than lightweight and midweight socks. 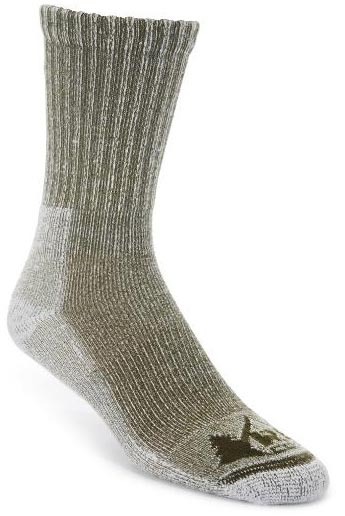 Another option for summer hikers is a lightweight hiking sock in a 1/4 height, which has less leg coverage and a more airy feeling but the same cushion on the foot. For winter hiking and mountaineering, the major brands make midweight and heavyweight options that provide much more warmth than the lightweight versions. Keep in mind that these burly socks are overkill for three-season hiking and casual use. In normal temperatures your feet will sweat, and despite merino’s impressive ability to wick moisture, you will get unwanted dampness. 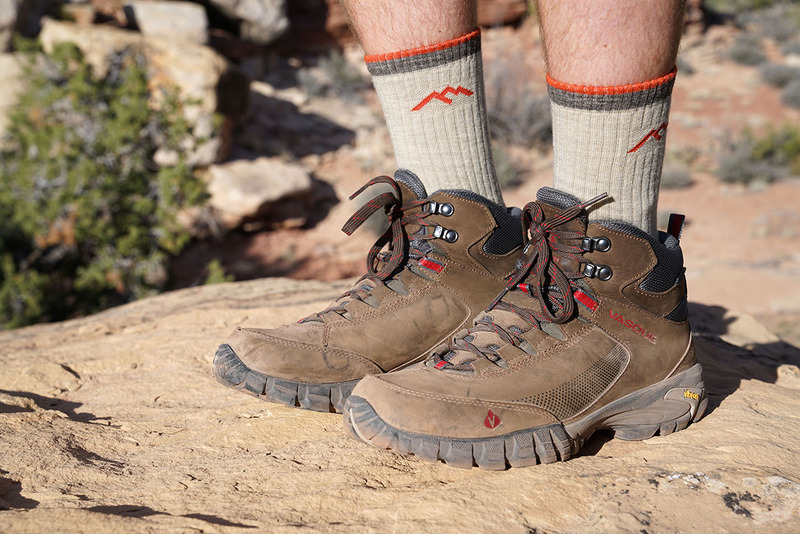 Crew is the most common hiking sock height, which extends 6 to 8 inches above the heel and at a least a couple of inches above just about any pair of hiking boots. We feel that this is the optimal height for hiking: crew socks don’t make you excessively hot and offer some added lower leg protection from brush and rocks. Hiking pants can be quite thin, so the extra cushion is helpful, and particularly if you’re wearing shorts on all but the easiest of trails, crew is the way to go. Quarter (1/4) height hiking socks cover the heel and ankle but don’t extend up the leg as far as crew socks. 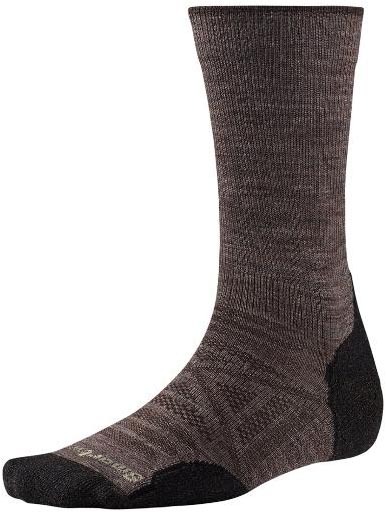 Minimalist hikers and those out in the heat of summer may prefer 1/4 socks like the Smartwool PhD Outdoor Ultra Light Mini, which work well so long as you aren’t wearing boots with high ankles (you may end up feeling some friction) and don’t need protection from abrasions. Many mountaineering and ski socks are knee high, which provide the added bonus of warming the lower portion of your leg. You can’t go wrong with any sock on this list, but our observations on hiking sock comfort are as follows. 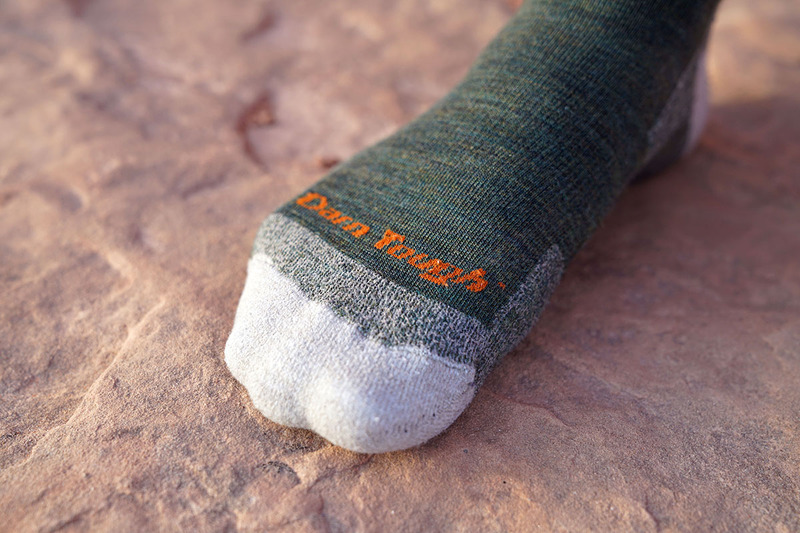 Darn Tough makes the best overall hiking socks taking into account comfort and performance, but they have a slightly thicker and denser feel than Smartwool. This isn’t a bad thing—Darn Tough last forever and can really take a beating (hence the name). 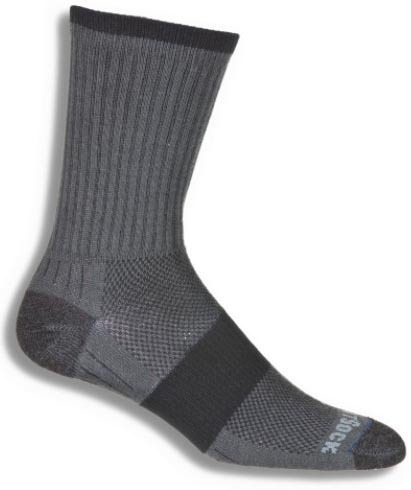 Smartwool hiking socks have great breathability and an excellent fit (particularly the performance PhD line), but they also have more issues with durability and holes. And brands like REI and Wigwam aim for the value-oriented buyer and their comfort levels diminish the fastest in our experience. All are great socks and the margins are thin in the comparisons above, but the distinctions between brands are worth noting. It’s incredible how many times we’ve put our hiking socks through the washer and dryer and had them come out feeling and fitting like new. Durability is brand specific and we’ve seen changes throughout the years even among the same manufacturers. 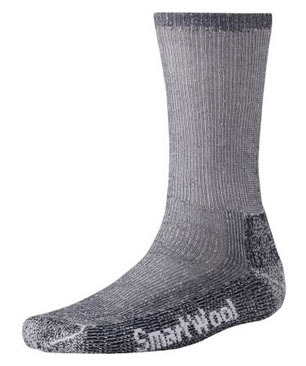 Smartwool, for example, has soft and comfortable socks but we’ve noticed holes developing more quickly than they used to (the recent change to Indestructawool has helped). Our REI socks have held up fairly well, but they seem to loosen over time. Darn Tough socks aren’t the softest but we have had no issues to date with holes with either their Micro Crew or Quarter Cushion, which is frankly pretty amazing. 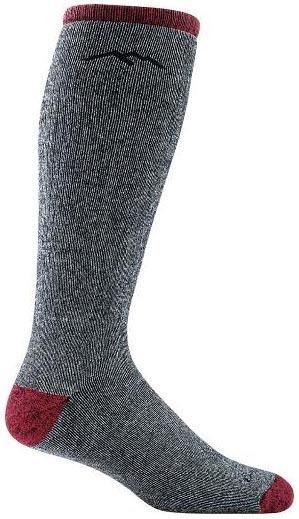 Virtually all wool socks have issues with pilling, which can be lessened by line drying. No matter the brand, you will be pleasantly surprised with how long a $20 pair of hiking socks can last. If you have a few pairs in the rotation, you can expect most hiking socks to last at least a couple of seasons if not more. We have multiple pairs in our sock drawer that are used both for outdoor adventures and around town, and we rarely have to replace them. For most merino wool products, we recommend washing in cold water and line drying. The directions vary by manufacturer and some claim merino can be machine dried, but we find that this significantly shortens the lifespan. However, merino wool hiking socks—along with their polyester counterparts—are one of the few items that we often throw in the dryer with our regular clothes. They just don’t tend to have the same durability issues as other merino products and the warm dryer has a nice way of getting the socks back to their original shape. We think you can go either way here in terms of line or machine drying, but keep in mind that you may get slightly more pilling and shrinkage in the dryer.